Before someone can approve time-off requests, they need to have approval rights for at least one Home Department. This tutorial walks you through setting up an employee with rights to approve both the Administration and Maintenance department time-off requests. 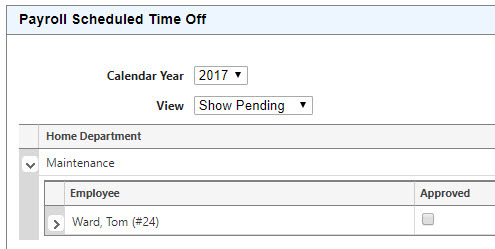 There are two ways to approve time-off requests; either using the "Payroll Scheduled Time Off" widget or by editing an employee record. The second part of this tutorial walks you through approving time off using the "Payroll Scheduled Time Off" wizard. For a visual tutorial, see the Include Multiple Time-Off Approvers at the Home Department Level video. 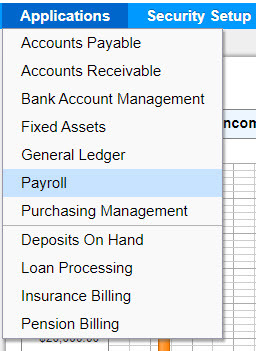 Log into the financials with full rights..
From the Top menu, select Applications > Payroll..
From the Payroll menu, select Modify > Employee Information. 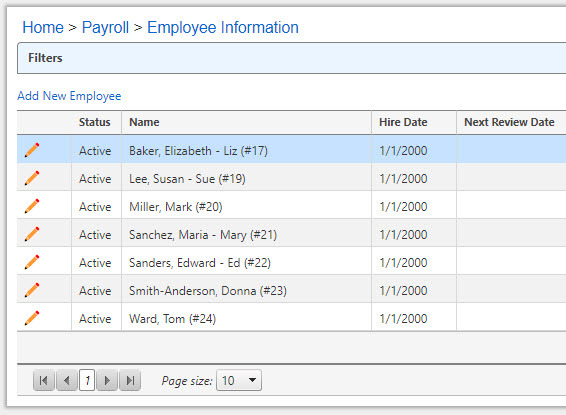 Select to edit an employee from the list (Elizabeth Baker). 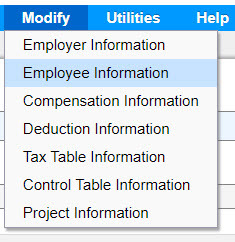 Assign this employee to have time off approval rights by checking the check box next to the corresponding home departments. Repeat for others (if needed). Log back in as Liz Baker. 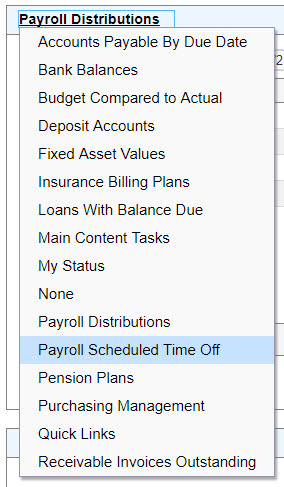 From the Payroll Dashboard, switch the widget from Payroll Distributions to Payroll Schedule Time Off..
Click the Expand icon to view the scheduled time-off days. Click the Approved check box next to the days that you approve. Alternately, you can approve time-off hours from the Employee Record.